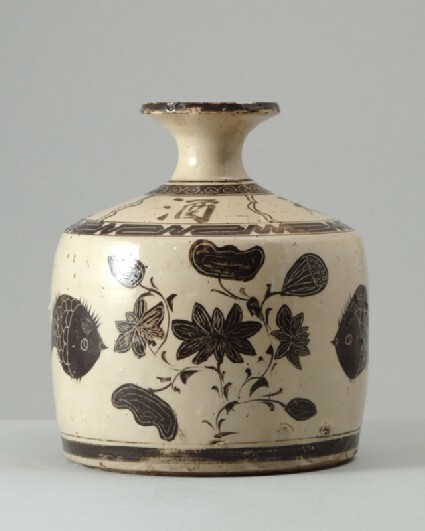 Wares in the style of Jin dynasty (1115–1234) Cizhou ware, such as this piece, with brown painted designs on a white slip, continue to be made and are used to this day as packaging for food. With its angular shape, simplistic painting style, dull slip colour and glossy glaze, the present bottle differs greatly from the originals and represents a late revival of an earlier style. This present type has come to light in excavations in Changzhi in Shanxi province. The bottle has straight sides and a waisted neck with flared rim; the base is nearly flat with a broad, shallow footring with concentric ridges from trimming. The light buff-coloured stoneware bears an off-white slip and a transparent glaze and is painted in dark brown with two plump fish flanking a clump of lotus, and a stylized peony spray with a small perched bird, all with details scratched into the pigment to appear in white. The shoulder is inscribed with four characters, separated by wavy lines and enclosed between a slanting key-fret and a white-on-brown scroll border. The rim is outlined in brown and a broad brown band encircles the base. The underside is unglazed. The inscription reads jiu qi chong tian (‘wine whose vapour soars to the sky’), perhaps a deliberate corruption of the expression nu qi chong tian (‘anger mounting to heaven’).